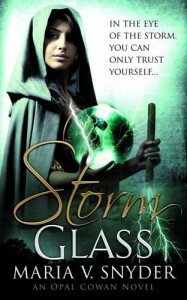 STORM GLASS is the first book in the GLASS trilogy, and the fourth book in the CHRONICLES OF IXIA. It tells the story of Opal Cowan, who first makes an appearance in FIRE STUDY (review). STORM GLASS takes place five years after the events of FIRE STUDY and sees Opal at Sitia’s magic academy, where she is unsure of her place and powers. Opal has a special ability with glass, and events see her travel with a Master magician to discover what is causing the Stormdancer clan’s deaths. At this point in the CHRONICLES OF IXIA Snyder chooses to switch narrators, which allows the focus of this narrative to switch from Yelena Zaltana to Opal Cowan. By doing this Snyder shows us another side of Ixia, and we get to learn more about another area of magic – glass magic. Although I really enjoyed Yelena’s story, I found Opal to be a really interesting character. She’s very different to Yelena and I think that worked well to separate the narrative voices. Opal is very unsure of herself and her powers, but at the same time she’s very clever and resourceful. The basic plot of STORM GLASS is that for some reason the glass orbs the Stormdancer clan uses to control storms are breaking, killing members of the clan. If the Stormdancers cannot harness the storms, then people will be killed. However, there is a lot more going on than that. All of which could cause a lot of trouble for Sitia and Ixia, especially as there is rebellion in the air. Snyder does a brilliant job at showing Opal’s unease at the academy, and her growing self-confidence as the story continues. I also liked the fact that although we have a new narrator, there was the return of some familiar faces in this book – and hopefully in the rest of the trilogy. If you have followed Yelena’s story and enjoyed it, then you should definitely consider exploring more of Ixia with Opal’s story. I’m really looking forward to continuing the story with SEA GLASS.